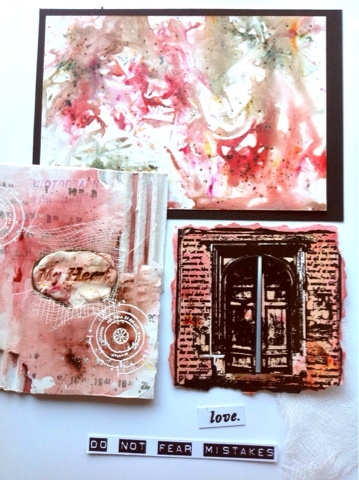 I was super lucky to be chosen to make a project for the Paperartsy 3UP week. 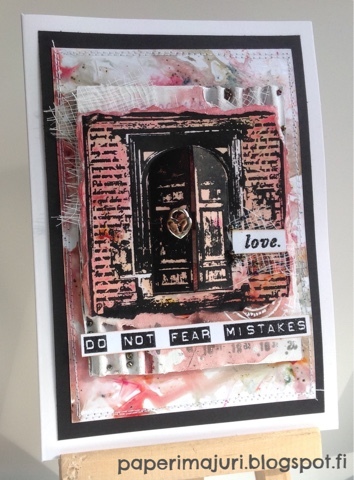 Every day three crafters get to feature a combination of Paperartsy stamp lines and different colour schemes on the Paperartsy blog. 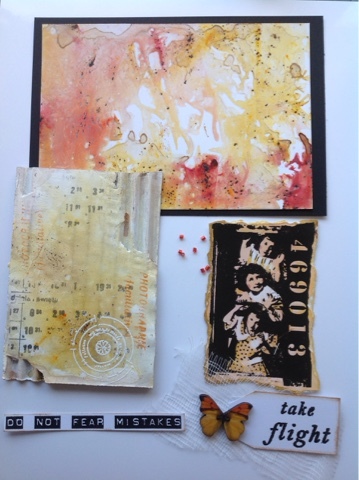 Today we are featuring Paperartsy Infusions (pigment powders with a twist), stamps from the Urban Snapshots series (US) and stamps by Sara Naumann from the Eclectica series (ESN). I am showing of the three cards I made and a bundle of experiments done with the Infusions. The top two rows have sprinkles of Infusion and a spritz of water. The first row has been rinsed immediately after spritzing, the second had the colour on it for a couple of minutes -enough for it to look brown, but all the brown rinsed of! 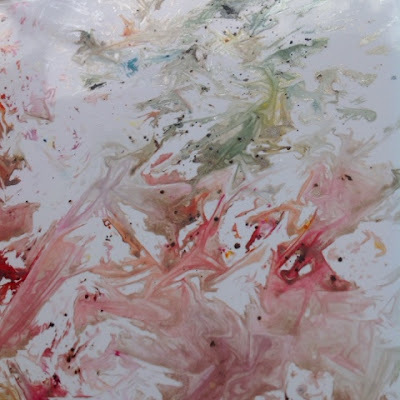 The next two rows have been splattered with Infusions that were dissolved into water on a plastic lid. The bokeh effect is interesting, but no matter how long the papers were under the puddle of colour, the brown rinsed of... But then a happy accident happened: I stamped some grunge paste and coloured it with infusions. I had some more pieces of the ink jet paper lying around and mopped the muddy brown puddle with them. I just set them aside to dry and that's the lowest row! The brown is there (very subtle, but you can see the dots) so the secret is not to rinse the paper. And even though the puddle looked like all the colours were a mess, they weren't. 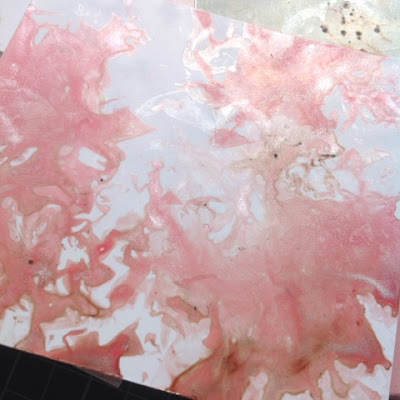 I love the marble look this gives, as if the paper takes a photo of the puddle it has been dipped in, so here is the next phase of experiments: ink jet photo paper dipped in infusions that have been dissolved in water on a craft sheet. I continued by adding thin kitchen plastic. I wrinkled the plastic on my craft sheet, spritzed with Perfect Pearls, sprinkled the Infusions, spritzed some more... And then just pressed the photo paper onto the mess. 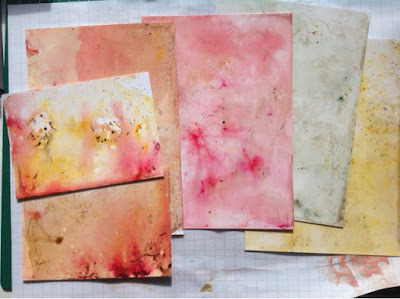 It reminded me of drawing gelli prints, no need to wait like you usually would with the wrinkly plastic method. After drawing a couple of "prints" with the wrinkly plastic, I carefully stretched it out and took a last one with the lines spread on the straight plastic. Great! These ended up in my cards (and I still have a pile to go...). The top line has just single colours, the rest are combinations. I managed to get some photos where the pearl sheen is actually visible. 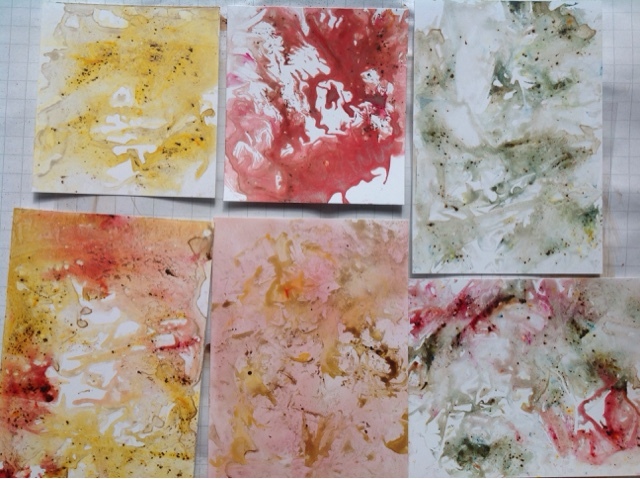 After these experiments I decided to try how the infusions would work on gesso. I cut some corrugated card board, ripped some corners for texture and covered the whole piece with gesso. Once the gesso was dry, I simply added a single colour of the infusions to each one. What's surprising is how nicely these work on a sealed surface. Many water soluble colours go rather pale on gesso, but these are nice! I continued with lots of background stamping using stamps from different ESN sets, picked the combinations of sentiments I wanted to use, made my focal images by stamping US stamps onto the photo paper with Versafine Onyx Black and colouring with the Infusions... and here I have each of the cards featured alone + a picture of the pieces before assembly. 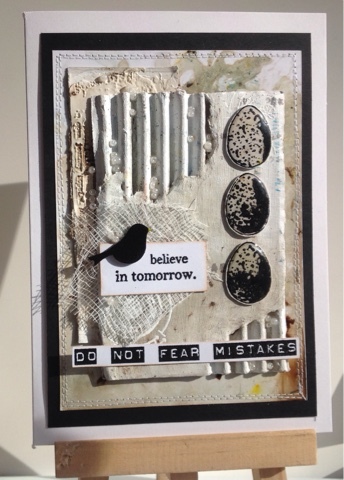 My idea actually built itself around the lovely "Do not fear mistakes" -stamp from USSL1 . 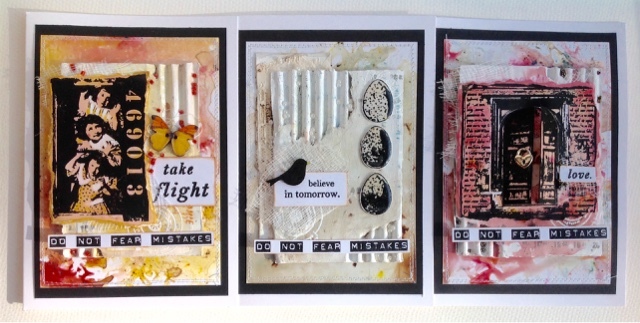 Combining it with short quotes/ parts of quotes from Sara Naumann stamp sets kind of gave me dozens of cool new quotes. I picked three, the rest are still waiting... and after this week is over, I'll be publishing more for sure! Background made with Golden Sands and Sunset Beach infusions, the same colours have been used to colour the stamped image with three girls. I first mixed some of both with water and dipped the photo paper. The result was a skin colour. After stamping I used bleach to get some white and the same infusions to add yellow on the dresses and pink on the cheeks. Sentiments from ESN15 and USSL1. Background with The Sage infusion (perhaps a touch of Golden Sands too?) The sage has been used for all the other pieces too. The eggs have a couple of layers of Glossy Accents on them and the wooden bird has been heat embossed with black. Sentiments from ESN20 and USSL1. Background with Sunset Beach and The Sage infusions. A piece of stamped and coloured Grunge Paste has been embedded into the piece of cardboard. The doors open so it can just and just be seen. I was lucky to find a heart locket for the door handle. Sentiments from ESN17 and USSL1. Interesting experiments with the infusions. Oh I adore your experiments especially the wrinkled plastic one, that is such a cool effect. Thanks for joining in and creating such great pieces. I love your cards Kristiina! Great tutorial, thank you! 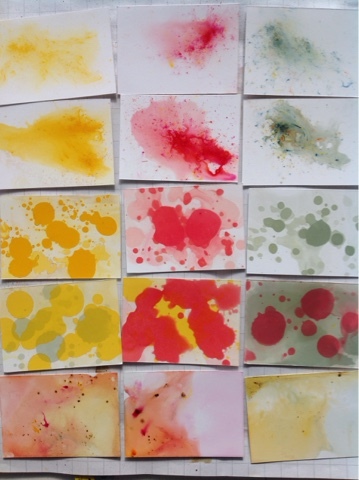 Love your creations, great to show all your experiments, I have learnt a lot from them, thanks for sharing those. 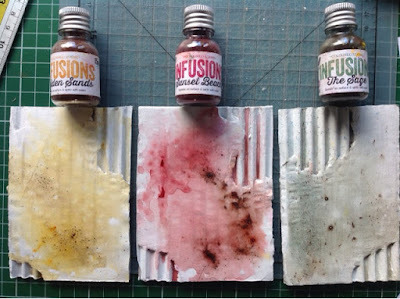 What wonderful textures you created with Infusions! 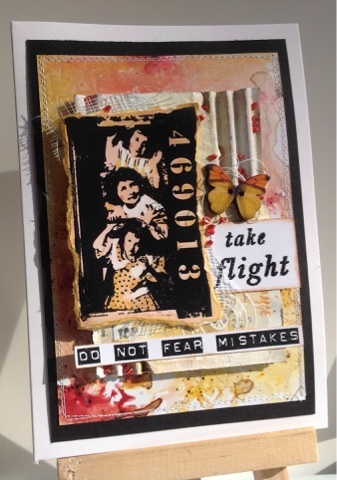 Each ATC is a miniature work of art! I love them all! Congrats on your feature! What a wonderful showcasing of the fabulous stamps and Infusions. 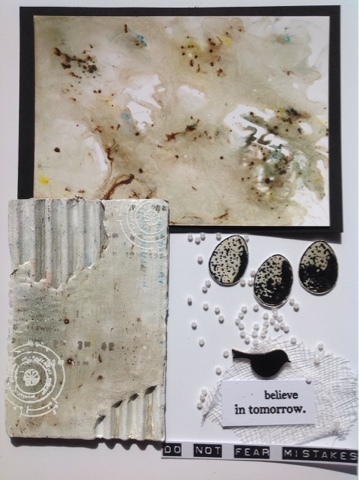 Love your three final pieces and you have some gorgeous pieces ready and waiting for more fabulous projects. Well done on a brilliant #3Up contribution!